On 21st May 2013, before gracing his ONE HD’s meet-and-greet event at the Upper Atrium Level UG, Paradigm Mall, he first greeted the members of the media at Hilton Kuala Lumpur. Upon entering the press conference room, members of the media were greeted warmly by a tall and lanky Jo In Sung with his bright smiling face. Just as the front row seats were occupied, we were surprised by his spontaneous act of grabbing one of the media’s mobile phone and took a playful selca of himself. We quickly realized that we’ll be dealing with a very cheeky actor that day. True enough, during the photo call prior to his Q&A session with us, he showed just how cheeky he can be. He responded well to the media’s call for his attention and I’d have to say, our cameras love him. During the Q&A session, he was asked on why he chose ‘That Winter The Wind Blows’ as his comeback drama after his military service and he said there was no reason for him not to accept the drama. It has such great writers working on the script, a great director and great actors and actresses on the team too. He playfully answered that he prepared on how to swindle people when asked about his preparation for the character of Oh Soo before revealing that Oh Soo is an ‘in-between two folds’ character. He had several meetings with the writers and directors in order for him to be able to properly grasp the essence of Oh Soo and bring the character forward. He also said that he wouldn’t choose a romantic comedy just because it is a romantic comedy but he will have consider whether he can project himself in the given role well. He wouldn’t go for romantic comedy just to appear as a funny guy on the block. Regarding the trademark long coat he was constantly wearing in the drama, he said he personally think that he looks good in it as it suits his height. He sends his gratitude to his parents for his tall and lanky stature. Being the cheeky guy as he is, he shoots a question back to the floor when we asked if there are any similarities between Oh Soo and himself in real life. He then said that Oh Soo and him posses some similar traits as he was showing his real self through out the drama. When asked whether he can read and write Braille in real life, he sighed and let out a heavy apology. It was too hard a thing to learn over the course of the drama. Just like any other actors, Jo In Sung said his basic desire is to work with great actresses and it was a great honor to have been able to work on this drama with Song Hye Gyo. ‘It was fantastic! (working with Song Hye Gyo)’ as he put it. He said the famous cotton candy scene was an awkward scene to shoot but it was a relief that it was well received by everyone that it became a signature scene. He also said that it was hard for him to let go of Oh Soo (or any characters) after living as that character for 5 months. The most memorable scene for him was the one when Oh Soo was ‘healed’ by Oh Young on a mansion while the hardest to shoot was the scene when Oh Soo dragged Oh Young to the mountain to tell her that ‘Today is the day I will throw you (out off my life)’. He finishes off the media session with a suave cheeky stature on his face offering handshakes and left the room with a smile. That evening, the Upper Atrium of Paradigm Mall was filled from the UG floor till the 2nd floor with avid fans of That Winter The Wind Blows. After much anticipation, the early birds were let into the main area with each receiving a tub of cotton candy. 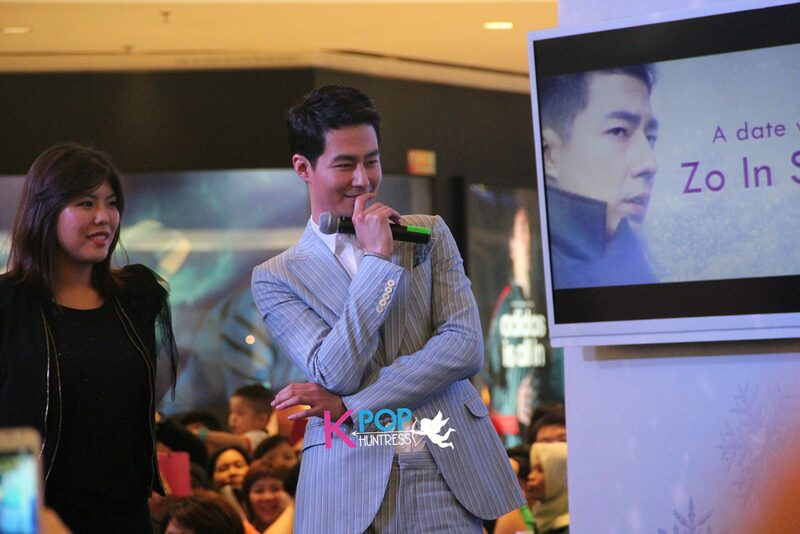 The atmosphere was tense with fans trying to get the best view of their favorite actor, Jo In Sung. Or were they waiting for the smooth and suave Oh Soo? After much anticipation, the man of the evening arrives in a pair of neat suit ready to sway the ladies off their feet. As expected from his press conference earlier that day, he graced the stage with his humor and cheekiness. He even judged a re-enactment of the famous Cotton Candy Scene competition between three pairs in which he later hands it down to the 2nd pair who he thought did it the best. Not only that, he even did that cotton candy scene with one of the contestant who had her lucky star shining over her that evening. Jo In Sung knows how to handle his fans as he kept giving his best fanservice to those who came (and those whose Lady Luck shone upon that evening). He was really touched by the overwhelming fans who came to see him as he thought nobody knows him in Malaysia. He mentioned in the press conference earlier that day that he counted (at the airport) that he have 13 fans here, so he wasn’t expecting much from the event. The event ended with him bowing and waving to every direction possible trying to pay attention to as many fans as he can. 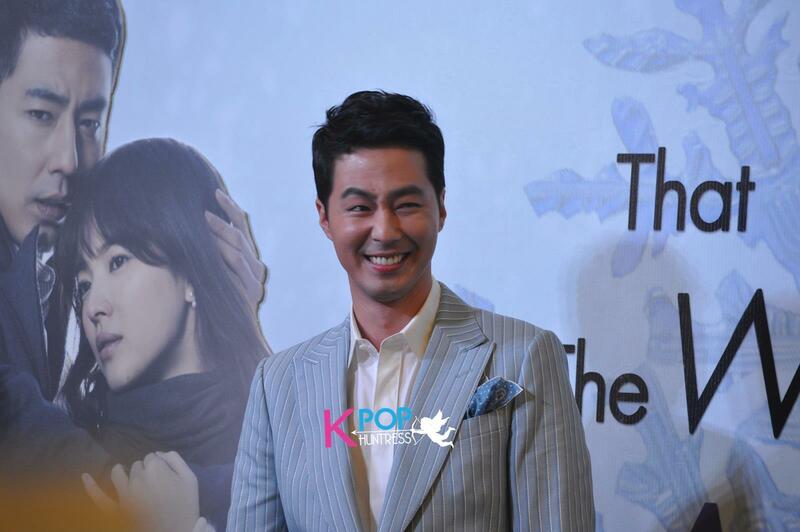 To all Jo In Sung fans out there, Jo In Sung said he will be returning to the big screen soon. Please anticipate his new project and continue supporting him in the future. Thanks to ONE HD for bringing Jo In Sung to our shores.